Maybe you read this years ago. I read it for the first time today. And, though I am no serene disciple, I resonate with this poem. 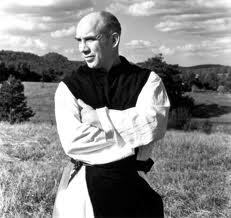 It's found in Selected Poems of Thomas Merton. I read it in Richard Rohr's book, Falling Upward, a reflection on the spiritual journey in the second half of life. What do you hear? What do you think? A reflection of the evolution of my general church from the 30's , where need was rampant and resources found only in God to the present excess of comfort where we do not rely totally on HIM. "God lives in his emptiness like an affliction." On a personal note, I am checking my roof lest I have no house tomorrow. Thanks. To John H, Thomas M. and Richard R. who are out of the ordinary.